Just a few years ago if you traveled in small town India you would see billboards offering medical transcription training. Students would be put through rigorous training to learn medical terms and also go through intense training to understand the American physician's accent on each of these highly technical medical terms. For the assurance was that once the doctor dictated notes in America and uploaded the audio file the transcription would be available the next morning in America - with 99% accuracy at a fraction of the cost to transcribe in America. Today medical transcription is slow business in India. Tax preparation was also an activity that paid some extra money to the tax preparer who did not have to be a CPA and even CPA's had some extra income during tax season. Similarly, legal documents like Wills provided simple work and a modest fee to the typical town lawyer in America. Medical transcription is becoming obsolete as electronic medical records via hand held devices become more accessible. Doctors follow evidence based medicine and check mark boxes on their devices. When integrated with insurance billing the diagnosis,treatment and billing is all squared away. Perfectly. Tax preparation is also taken over by tax preparation software . For next year Intuit the makers of Turbo Tax will offer free telephone advise to capture a segment of customers who feel challenged and go to tax prep chains like H&R Block. Turbo Tax via self service costs $44 and a return at H&R Block costs $188. Legal Document Services are expensive and according to a report 80% Americans cannot afford legal fees and therefore take the help of sites like Legalzoom and Rocket Lawyer. In the process the local lawyer loses fees. So no matter what your organization's service offering, be sure that what can be done by self-service technology will be done so by your customers. It is therefore timely to think about expanding your services to offer unbeatable value to your customers. Value that builds on your expertise and the work that your customer can do via self service. A tough one sometimes when you are competing against self-service technology and not just low-cost overseas competition. I am really glad to see the surge of recent interest on knowledge process outsourcing and the shared service domain. End of March you have the Orlando Florida event where you have the eminent strategy guru Ram Charan leading the proceedings. On a more applied and "what I can I do with this KPO thing specifically" note is the nice event at New York on April 29 and 30 . The KPO summit is chaired by the noted Duke University Professor Arie Y. Lewin . Talks include financial sector KPO by Andy Eftathiou ; types of KPO including business,investment and legal research by Suresh Yannamani ;the India advantage by Ron Somers, and a KPO best practices panel discussion with Vasant Bennett , Ken Cutshaw EVP and General Counsel of Church's Chicken and Ranjit Dua of Dua Associates. On April 30th we have Julio Ramirez on finance and accounting KPO, Marcia Mcleod of Williams Energy on contracting, Lawrence A. Schultis on risk management in contracting, Jack Diggle of Prince OMC on managing human resources in KPO, A group from CPA Global ( Bhaskar Bagchi, Inder Duggal and Susan Hanstad) with an operational KPO case study; comparing India,Ghana,Philipines and Eastern Europe for KPO with Harry van Geijn of Fortis Insurance International; a case study of managing the "stay behind" workforce by Steve Hosle of AOL followed by Fauzia Zaman Malik of Accenture on captive vs build operate and transfer (BOT) models and finally Frank Cocuzza of Penske (check out this story here) on relationship governance for KPO. Those new to BPO and KPO might like to attend the pre-conference sessions by David Perla of Pangea3 LLC to prep for the main event. KPO has indeed come a long way from my various efforts since 2005 on "Global Outsourcing of Knowledge Based Services"! Knowledge Process Outsourcing (KPO) is back in the news with estimates ranging from $10-17 Billion/year volume by 2010. I ran the first ever MBA elective on "Global Outsourcing of Knowledge Based Services" in Fall 2005 - and a CAPM seminar in April 2006, with the same title. While well attended, I think KPO classes and seminars were rather early for 2005. During those early years "outsourcing" was a scary word associated only with layoffs. Globalization and its opportunities was something that was not clearly apparent. It was nice therefore to read the KPMG report that explains the difference between "BPO" (Business Process Outsourcing ) and Knowledge Process Outsourcing particularly for the financial sector. The report is well written though I would disagree with the rather provocative subheading ...."outsourcing the core". You really cannot outsource your core competence but you can certainly re-define what your firm's core competence is when you can get a knowledge task like equity research done overseas at a low cost. But all in all a great report ! I was rather happy to read the Aberdeen report's summary which highlights that global product design and development leads to reduction in product development time and time to market while allowing the protection of intellectual property through Digital Rights Management. 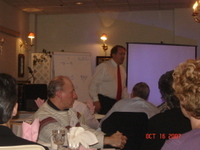 The talk by Jim Bergman on Tuesday at CAPM turned out to be great. Jim gave folks a heads up on IACCM and the real need for the buy-sell and legal side of companies to speak to each other instead of remaining in their silos.Organizations tend to, for example, not really understand their customer warranty requirements and then seek similar warranty requirements from suppliers. Instead, marketing and sales gives out warranties to customers without Procurement and Supply managers trying to transfer the risk upstream. For example, a supplier might offer a 2 year warranty as standard and procurement managers accept this as a bonus without working for a lower price since their onward customer warranty might be just one year and they are needlessly paying for warranty that is neither needed nor ever used. The fun part of Jim's presentation was the acronym LOL which you might think is "Laughing out Loud." Not so. LOL is "Limitation of Liability" and it is the most negotiated clause in buyer seller negotiations according to IACCM suveys, year after year. I felt that the audience was both energized and intrigued by this finding particularly because no one could disagree, nor like to admit it! All in all a very nice event as was the venue the il Monteicello restaurant. 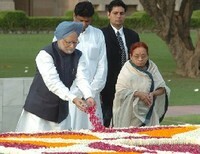 As I watched Dr. Manmohan Singh, India's Prime Minister first pay traditional tribute at the Raj Ghat, the memorial built for Mahatma Gandhi the father of modern India and then unfurl the Indian flag I was struck with a sense of awe. Awe because India has achieved the seemingly impossible, built a democratic open society with a population of over 1 Billion diverse people with multiple differences in languages,religions and culture. I guess Gandhi figured out the moral path in an absolute brilliant fashion. His model was "Ram Rajya" the Hindu ideal kingdom of Lord Rama where the king and Lord Himself is extremely careful about public opinion and carrying people along with both government and personal actions. By being able to dovetail modern western democratic notions to ancient Indian ones the Mahatma formed the foundation that allowed Dr. Manmohan Singh an Oxford Ph.D. in Economics and a minority Sikh to become Prime Minister and be acceptable to a bunch of sometimes difficult coalition partners. Awe because India's President is a woman Pratibha Patil who replaced Dr. Abdul Kalam a rocket scientist who is also a muslim. Awed because the President of the ruling Congress Party ( the Mahatma's party) is an Italian catholic Sonia Gandhi who dresses in a saree and had given up the chance to become Prime Minister, thus striking a chord among India's masses because this is exactly what the Mahatma would recommend and Lord Rama would approve! On the ground however, poverty is still widespread and Dr. Singh emphasized that there was no success without ensuring basic living for all. He talked about healthcare and pensions for the 65 plus who are below the poverty line. Dr. Singh referred to the need for electricity and roads that have become, with drinking water, the top priority for Indian democracy in contrast to the more basic food,clothing shelter theme of the eighties. Dr. Singh was silent about controlling corruption but then the multiple newspapers and media have a great time doing "sting" operations to catch politicians and officials on the wrong foot as does the vibrant Bollywood film industry. I wonder whether it is just the sixty years or the ability to dovetail traditional democratic values, that makes democracy work in a relatively poor and populous country. In any event , democracy does work and Dr. Singh announced opening up of many more schools and Universities to thunderous applause. The goal was to eventually provide opportunities for low cost college education to 20% of the people. Just being able to read and write was not enough according to Dr. Singh, people needed to do better on the knowledge front to be able to contribute to the new global order. So what has this got to do with India being a great global knowledge partner? Simply this : that an open democratic society allows other global partners to know what is going on with minimal effort. For example, a few emails or well placed skype calls might get you a fast "on the ground" view from an Indian partner's friends and enemies! The picture may not be always pretty but at least you get the picture - not something you can say for partners in other countries with more closed political systems. Outsourcing is not simply to reduce cost and potentially improve efficiency and increase innovation. It clearly is a way of getting a contractor or business partner to do "non-core" things which you cannot do, unable to do and perhaps think that you don't need to do. I was still in my "legal" mind frame when I noticed a great article by John Gliedman in Computer World. Obviously John knows what he's talking about and I think the points he makes are really interesting. In fact I have academic papers on some of these points. For example, issue 4 about who owns the Intellectual Property is a question I have tried to rephrase in my research and also in my MBA class. I am saying that IP needs to be managed in the relationship and in a way John says the same- basically do not leave this question unaddressed at the contracting stage. Take issue 5, about hiring employees. An Engineering Industry speaker in my class mentioned that they identify top talent and then hire them, but my sense is that they have a clear understanding with the provider and the provider is on board with this arrangement. What blew me away was the importance the article attaches to "transition" management (Issue 6) - Why are both outsourcers and providers missing this one?? You can hire a very smart lawyer in India for about 700$ a month compared to the 350$ per hour you need to pay for a similar lawyer in the US. The tasks are myriad that can be done from overseas and these are called "LPO". Tasks could include, patent searches, research into history of judgments on any field whether corporate,marriage or family law. Talking to a really smart lawyer friend over the weekend- I understand that the constraint to complete delivery of legal services is the authority of a lawyer to practice law in a particular state as per the State Bar Association. Just like doctors must pass the State medical exam, lawyers must pass exams in the State to practice law in that State. However, given that LPO is growing rapidly there seems to be an interesting split between the components and tasks in onshore and offshore legal work.